this minute order: http://www.arkansashighways.com/forums/Minute_Order_2012-025.pdf authorizes a study to re-evaluate long term improvement needs for the U.S. Highway 67 Corridor from Walnut Ridge to the Missouri state line. This is a planning study and we anticipate completing it this spring. The final product will discuss feasible alternatives but will not identify a preferred alternative. The latter will be carried out through the NEPA process. In other business, Corning Mayor Dewayne Phelan added the Missouri Department of Transportation met and one of the items they talked about was extending Highway 67 to the Arkansas state line. For the past few years state and federal highway dollars have been converting Arkansas 226 into a 4-lane highway connecting U.S. 67 with Jonesboro — the last link for a long-awaited 4-lane corridor from Northeast Arkansas to Little Rock. The project is down to the last few miles. 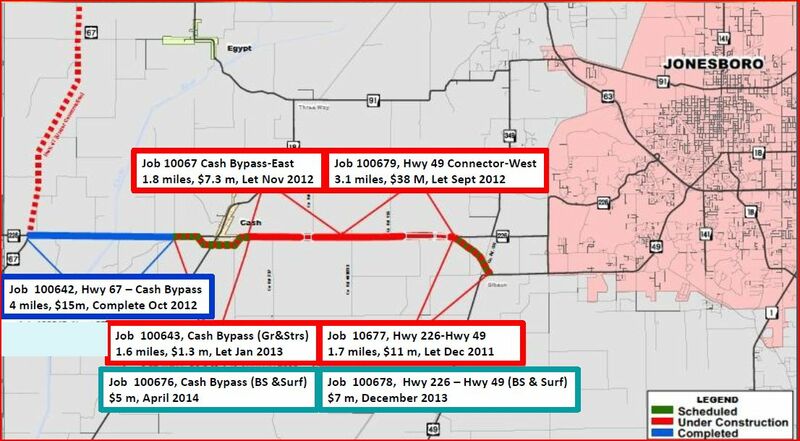 But Perrin, who usually attends meetings of the Arkansas Highway Commission, had not heard state Highway Director Scott Bennett’s announcement that bids for the Cash bypass segment, scheduled for April, will not be advertised. That project was one of 10 put on hold. Therefore, for at least a while longer Jonesboro will remain Arkansas’ largest city not connected to the rest of the state with a 4-lane highway. U.S. 63 is four lanes from Jonesboro to Interstate 55 and from there on to Memphis. It’s also known as the “future I-555” because funding to complete it to interstate standards also remains on hold. Highway officials have been promising a 4-lane highway to Jonesboro since at least the early 1990s, but for many years a major share of new highway funding was channeled to Northwest Arkansas to complete Interstate 540. Foxx has warned that the Highway Trust Fund will be “bouncing checks” starting this summer unless Congress passes a funding solution. That’s why Arkansas highway officials decided to delay the April bidding process. Perrin told a reporter that if the projects were bid and the Federal Highway Administration didn’t provide reimbursement, the state department could be down to $6 million to operate statewide for the rest of the year. Foxx has warned that the Highway Trust Fund will be “bouncing checks” starting this summer unless Congress passes a funding solution. That's what AHTD gets for bypassing Cash. I guess they should've used the plastic instead? Corning Mayor Dewayne Phelan added the Missouri Department of Transportation met and one of the items they talked about was extending Highway 67 to the Arkansas state line. I'm guessing that MoDOT means a four-lane upgrade instead of merely adding passing lanes. Word from the MoDOT District Engineer is that it will be a four-lane expressway similar to the rest of the corridor to the north. That stated, we are in the process of completing the "new" U.S. 67 study that will present several alternatives to meet them at the state line. The draft of this study is being circulated internally for review and in the coming months will be finalized. Public meetings will be held to present those findings. We used the term "new" U.S. 67 study because when Missouri indicated they couldn't meet us at the line with a four-lane facility, we went back to the drawing board. When is the swifton - hoxie section planned to be completed? Is this an in house evaluation or is a consultant doing it? So how is the future I-57 coming along these days? Seriously, I also believe that if this corridor receives an interstate designation, it should be I-57 since the freeway would go more north-south than east-west. However, it would be fine just as US 67. It has been referred to as Future I-30 for years by AHTD and I would be willing to bet that is what the final number will be. Considering that the present plans are for merely a 5-lane arterial rather than a full freeway, it may not be Future anything for quite a long time. Personally, if you ask me, if it is upgraded to freeway, it should be I-53, extended to the Avenue of the Saints corridor. It would be silly for it to be a freeway all the way from North Little Rock to Sikeston with a gap between Walnut Ridge and Poplar Bluff. Even if they build the "Arkansas freeway" I expect a new terrain freeway to be eventually built. I agree. Plus, it would be strange to have I-30 cross north of I-40 and continue north(east). You have I-75 and I-85 at Atlanta where I-75 is WEST of I-75 and then terminating at I-65. I don't think Missouri is going to make their part interstate quality. Missouri is going to most likely just multilane US 67. I-30 will most likely be the designation. Arkansas should just sign it as I-30 now. What are they waiting on? That's very true. And now that I think about it, I-57 would be west of I-55. You have I-75 and I-85 at Atlanta where I-85 is WEST of I-75 and then terminating at I-65. Because of the current way the interstate system is set up, there are going to be instances where numbers will "cross over." ^ But there's an easy fix here: Number it as I-53 instead, with the intent to extend the designation further north up US 67 in Missouri as the corridor is upgraded, and maybe up the Avenue of the Saints Corridor in the far future. US 60 isn't full freeway between Poplar Bluff and Sikeston. Surely US412 is so numbered because it is planned to upgrade it? Going on 412 across the Bootheel of Missouri is the same distance between Cairo and Little Rock as going via Poplar Bluff, but the route makes more sense from a national perspective, and from an AR perspective, given it would link to I-69. With this sort of routing, AR could take I-30 via Jonesboro, rather than Walnut Ridge. Don't forget that north of Cincinnati, I-71 is east of I-75. Why that didn't get I-73 instead is beyond me, but I guess it was better off reserved for future use somewhere else (NC for one).